Funworks have spent years developing a teaching methodology where learners actively participate in their learning. The textbooks are filled in activities which teach underlying principles. Learners are encouraged to adapt code and explore “What if” situations. Each activity is designed to increase the skills of the learner and build on their knowledge of programming. Exercises and Check Points are placed at strategic points to consolidate the learners knowledge and skills. With the move from structured programming to Object Oriented Programming (OOP) we have used Scratch to introduce the concept of fields and behaviours for a Sprite. To make the move from Scratch to Delphi or Java, we have used a Gogga class which creates a visual “bug” that can be programmed to move around the screen. 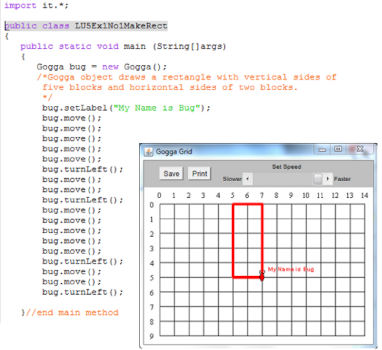 The program below creates a bug object (see the Gogga Grid) and provides methods to move the object to create a rectangle. The Gogga class is versatile and extremely simple, providing opportunity for learners to use loops to move the Gogga object repeatedly. It is also designed to teach inheritance where a more “intelligent” Gogga can be developed. From experience, the Gogga class is an effective mechanism to teach OOP as learners are able to see what their code is doing by following the patterns of the object. Each Gogga object had fields (such as x, y, colour and direction) and methods (such as move, turnLeft and turnRight).